The broader NSE Nifty jumped 92.55 points, or 0.87 per cent, to 10,693.70. The BSE Sensex rallied 361.12 points, or 1.02 per cent, to close at 35,673.25. 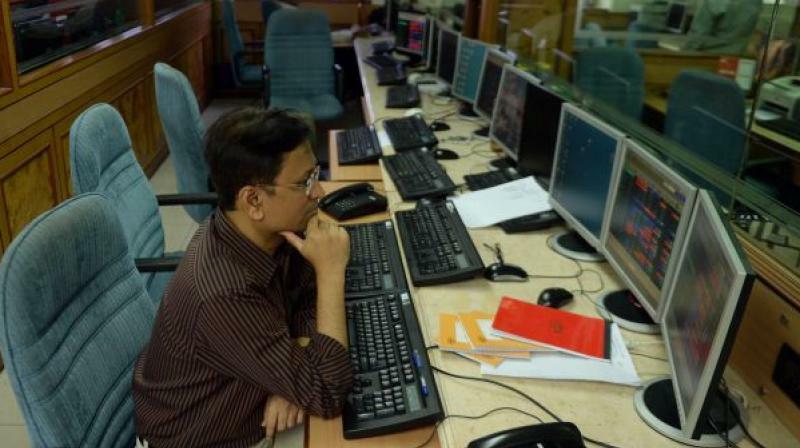 Mumbai: Benchmark indices broke their three-day falling streak Friday driven by strength in global equities, sliding crude prices, recovering rupee and a surge in Kotak Bank shares on reports that Berkshire Hathaway was planning to pick up stake in the lender. Kotak Mahindra Bank was the biggest gainer on both the indices, ending nearly 9 per cent higher following reports that Warren Buffett's Berkshire Hathaway Inc was planning to pick up stake in the private sector lender. According to media reports, Berkshire Hathaway may invest between USD 4 billion and USD 6 billion in the lender by buying promoter stake or through a preferential allotment. Other gainers included Adani Ports, Bajaj Auto, Infosys, Asian Paints, Maruti, HUL, L&T, M&M, ICICI Bank and Reliance Industries, rising up to 3 per cent. Top losers were Sun Pharma, Coal India, Yes Bank, PowerGrid and NTPC, sliding up to 2 per cent. Investors also took positive cues from Asian and European equities after US Fed Chairman Jerome Powell signalled that the three-year tightening cycle was drawing to a close, and IMF chief Christine Lagarde said that the US was not likely to see an economic contraction in the near term. The rupee appreciated by 24 paise to 70.66 against the US dollar in intra-day trade amid weakness in the greenback against some currencies overseas. Oil prices eased further on worries that a meeting of Opec and non-Opec producers will not agree to a cut in output. Brent crude, the international benchmark, was trading 0.72 per cent lower at USD 59.63 per barrel. Meanwhile, on a net basis, foreign portfolio investors (FPIs) bought shares worth Rs 72.47 crore on Thursday, while domestic institutional investors (DIIs) were net sellers to the tune of Rs 389.78 crore, provisional data available with BSE showed. Elsewhere in Asia, Korea's Kospi rose 0.34 per cent, Japan's Nikkei gained 0.82 per cent, Shanghai Composite Index edged 0.02 per cent higher, while Hong Kong's Hang Seng shed 0.35 per cent. In Europe, Frankfurt's DAX rose 0.85 per cent and Paris' CAC 40 gained 1.40 per cent in early deals. London's FTSE too jumped 1.53 per cent.